These new battery tools are currently only available starting with starting with iOS 11.3, so make sure you update your software to take advantage of this new feature. Once your iPhone is running the latest version of iOS 11.3, open your Settings app. 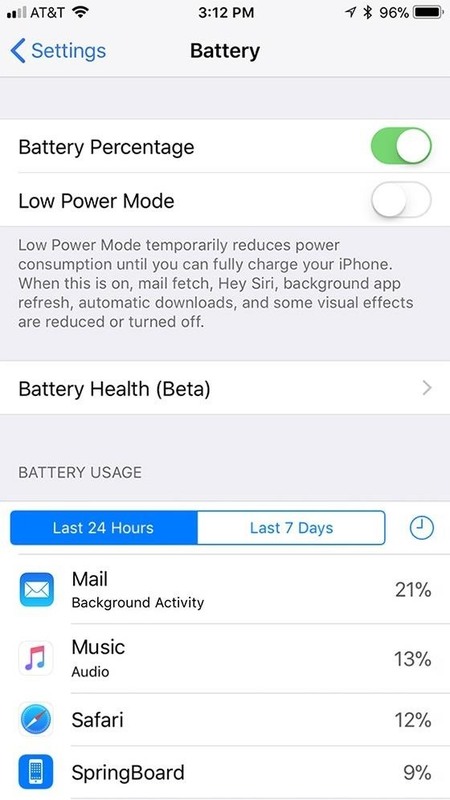 Tap "Battery," then tap "Battery Health (Beta)." You will see two measurements: Maximum Capacity, which shows your iPhone's battery capacity compared to when it was new, and Peak Performance Capability, which will report how healthy the battery is during peak performance. This latter option is our focus. If the text underneath Peak Performance Capability reads "normal," you have nothing to worry about. Your performance is not being throttled. However, if your iPhone can no longer read the status of the battery, there will be no percentage next to Maximum Capacity and it will suggest that you take your iPhone to the Apple Store or a repair shop to have diagnostics run. 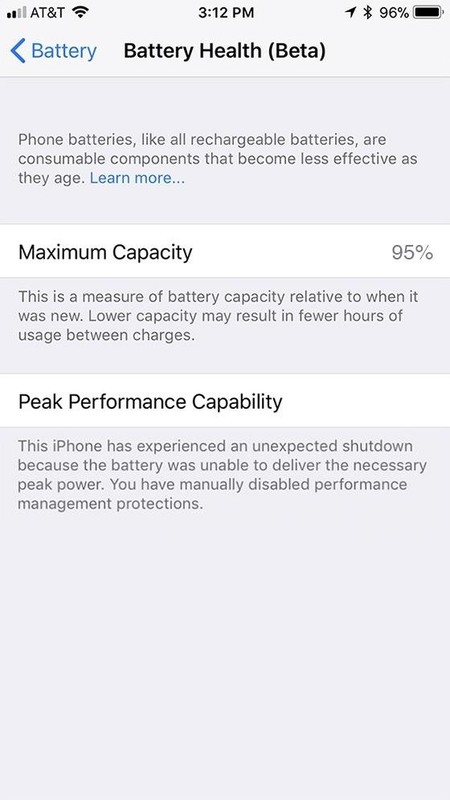 If your iPhone experiences at least one battery shutdown, it will automatically activate performance management, Apple's term for performance throttling, since the battery is "unable to deliver the necessary peak power." In this case, you will see a blue "Disable" link in the text below Peak Performance Capability. Models in which performance throttling could be happening include the iPhone 6, iPhone 6 Plus, iPhone SE, iPhone 6s, iPhone 6s Plus, iPhone 7 and iPhone 7 Plus. If you have an iPhone 8, iPhone 8 Plus, or iPhone X, you will never see a "Disable" option since hardware fixes have been implemented. To disable performance throttling, simply tap the "Disable" link. After doing so, it will state that "you have manually disabled performance management protections." Unfortunately, there is no way to reverse this action manually. If you disable it, you won't be able to enable the feature unless your iPhone experiences another battery shutdown. With that said, that also means your decision to disable power throttling is only good until your iPhone automatically enables it again. If the battery percentage next to Maximum Capacity is low, it may also recommend you get your battery serviced at the bottom of the page, which might mean that it's time to try to get that $29 battery replacement from Apple. 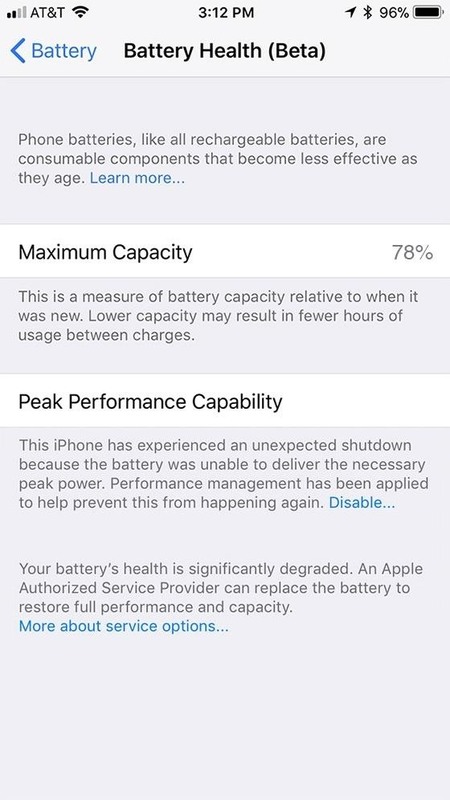 Even if you don't witness a shutdown, you should periodically check your battery health settings to make sure the setting has not re-enabled itself and to make sure your battery health hasn't been degraded.